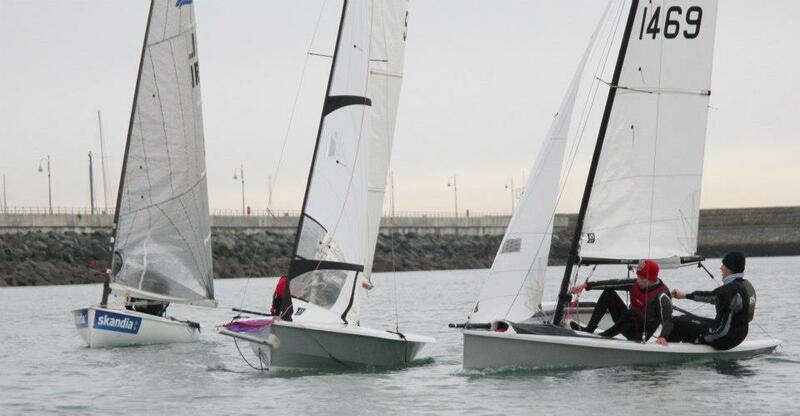 The OK Dinghies in Dublin do stand out in a crowd. Beastie’s all-varnished-wood is major eye-candy. The Milky Bar Kid’s got less Wow factor, but the cream hull and wood deck catch the eye too. And yet, two weeks in a row, there are no pictures of the OKs during the Sunday racing. It was indeed a lousy day for photos, but we love the pics even if we’re not in them. A fireball approaching the windward mark in the rain. The OK is the distant smudge back by the boat. Sunday morning dawned bright but with absolutely no wind so Beastie’s morning training session was cancelled. The wind started to come up from total calm for the afternoon racing and as the pictures show, along came the rain. The OK got another bad start. So far, port end starts don’t seem to work well when the starboard tackers are faster boats unless the bias is REALLY huge. Kinda obvious really. Doh. At least this week the OK managed to stay clear of other boats but still ended up crossing behind one of the Vagos and struggling up to the first mark. 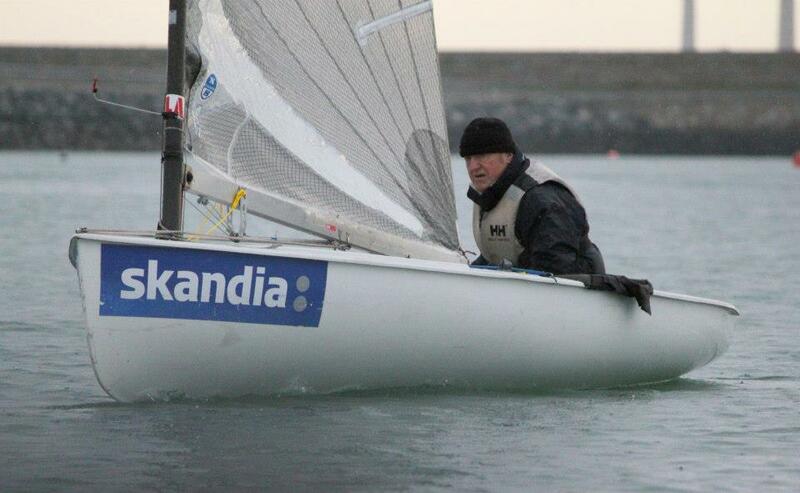 Des Fortune in the Finn was going very well up the first beat in the light airs and rounded with the RS400 and the 200. The 470 was there too. The OK was well behind at this stage. Brian O’Hare is getting up to speed in his new RS400 and disappeared off into the distance with the others, including the Finn, Enzo Michel’s RS200 and Richard Tate’s 400 in hot pursuit. 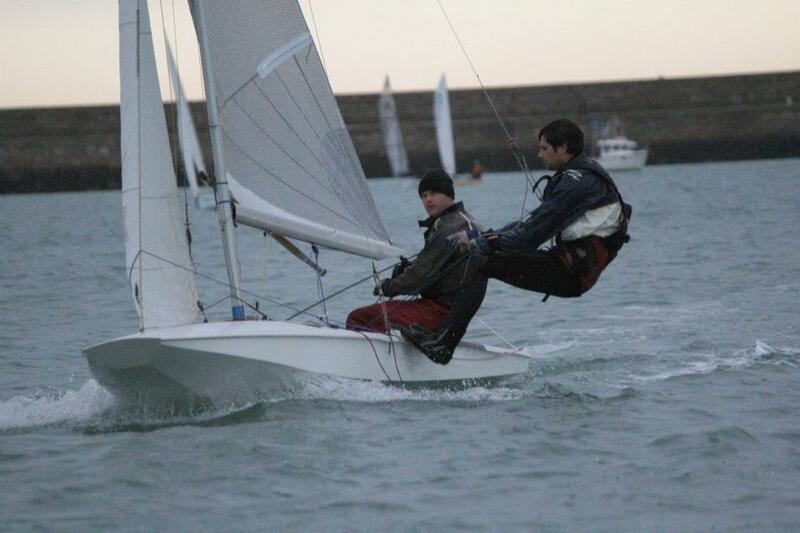 O’Hare’s RS400 and the Ryan/MacAree 470 were the lead two boats, ultimately also leading over the line. Meantime the OK was trying to get clear of the IDRA14s, which is always tricky. Again the GP14 seemed to be struggling for speed in the light stuff and dropped back through the race. It seems to go better in breeze and there wasn’t much of that today. Des Fortune was still going well in the Finn and keeping in touch with two-handed boats. That’s not easy in the light stuff, when they can typically point higher. Des’s Finn mixing it with the RS mob. Not bad on a light wind day. The OK only passed the IDRAs at the 2nd leeward mark. The two IDRAs held the inside lane but slowed enough dropping spinnakers to allow the OK to round outside and lead away from the mark. However, at that stage O’Hare and Michel in the RS400 and RS200 were probably in the lead on corrected time. All changed with the leading boats half way up the 4th beat. A big left shift was coming in from the north. The OK saw it coming, dug left, caught the breeze and took back big chunks of time on most of the boats ahead – especially those that had gone right on the beat. Richard Tate suffered particularly badly, having headed for the normally safe right hand side. Now he found himself passed by the OK and the K1 and nearly caught by an IDRA14, all of whom had rounded way behind him but caught the new wind earlier. He stayed calm and quickly pulled away again, although there’s no way to recover from that on corrected time. The Finn was in a decent position and didn’t lose ground, being able to fetch the mark after the shift arrived. The rest of the race was fairly processional, with the shift having turned all the legs into fetches or broad reaches. Des Fortune in the Finn took home the DMYC Mug on the day. 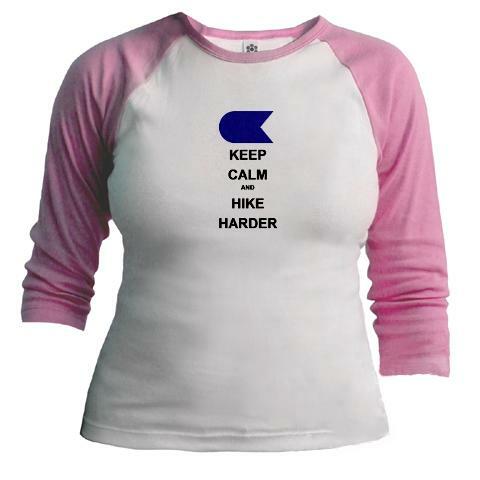 Those go to the top finisher who hasn’t already got a Mug. Des was 3rd on corrected time and a deserved winner. Des Fortune in the Sunday rain. Going well. Mug winner on the day. The OK got the race win again, which now makes it four 1sts and two 2nds from six races. However, it has to be said that the 4th beat brought the OK to the top of the rankings, with the leading boats caught on the wrong side of a big shift. Again, the Hamilton IDRA was right behind, only 13 seconds adrift on corrected time. Tune in the OK was a LOT better in the light stuff today than even a few months ago. Increased sensitivity to mainsheet tension helps enormously. Now we just need to fix the light air starts, which have been dreadful recently, and fix the roll tacks and gybes. Right now they’re not elegant, to say the least. Over in the Lasers, our summertime rivals, Colin Galavan was back on the top step of the podium. There are lots of new names in the Laser fleet, which is good. Of course they should sail OKs, but we’ll forgive them.